Our new Casual Match feature is finally live! Casual Match is the new Prismata mode, featuring unranked player vs player and bot play. 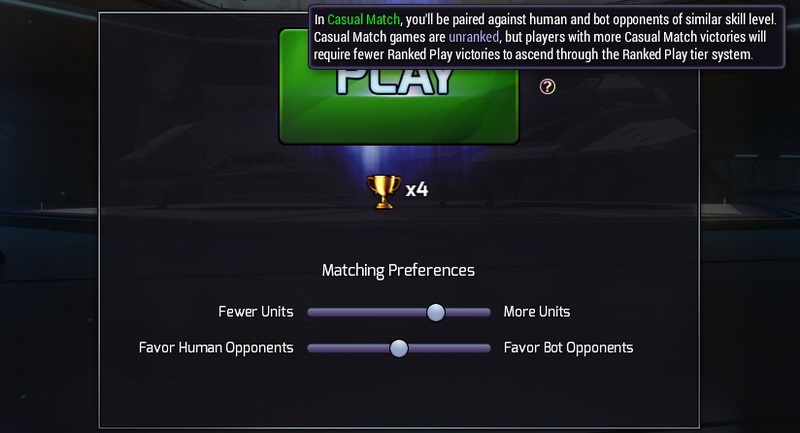 Casual Match was designed mainly for newer players, as well as the large cohort of players who frequently play Master Bot but don’t play much Ranked Play. The new mode offers more variety, as there are over 25 different unique bot personalities, some of whom are very tough! Wins in Casual Match mode earn you prizes. They also provide a bit of a boost if you’re trying to ascend through the early tiers of Ranked Play mode. I just wanted to deliver a quick update on how things are coming with our next patch, which includes a massive bot overhaul, Casual Match queues, new achievements, and more. 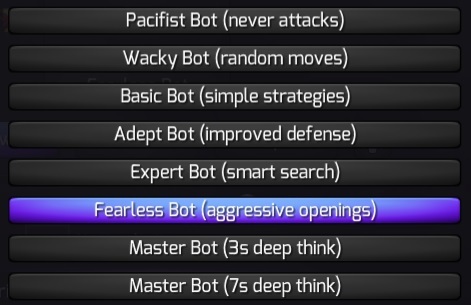 I’m incredibly excited about this update—for one thing, it adds many new bot personalities, and we’ve found in testing that these personalities present many interesting and enjoyable challenges. Some very good news: thanks to a lot of ground work put in by our AI developer Dave, we’ve been able to extend the scope of these personalities far beyond what we thought was originally possible. We’ve added hundreds of custom bot openings of various types (aggressive, economic, and so on) and created dozens of new bot personalities. Last week, we did our final Reward Reset. Things went smoothly, but we received a few reports from players who received fewer Shards and Omnipower Cores than expected. It turned out that we had forgotten to include level-up rewards for some players when recalculating their inventory contents after the reset. This has now been corrected, so a few Prismata players might see a few extra shards or Power Cores show up in their inventories when they next log in. I’m currently adding the final touches to our Casual Match mode and new bot update, so look forward to that later this week! The Prismata server will shut down at approximately 4pm ET tomorrow (Thursday, January 26) for 30-60 minutes. Players will lose all skins/emotes/infusions they have collected so far (but will keep those unlocked as real-money purchases, prizes, or using Kickstarter/Paypal reward codes). Players’ current Armory and Black Lab status will be wiped. Players will receive a rebate of Power Cores, Omnipower Cores, Black Cards, Infusions, and Shards commensurate with how many have been earned so far. This reset will be similar to the previous one. Edit: The Fair Play Policy has been updated as a result of community feedback; please have another look! Prismata is quickly approaching its public Steam Beta, and we’ll soon be expecting a large amount of growth in the size of our community. Accordingly, we feel that it’s time to introduce some official policies and procedures to help manage our community and maintain the integrity of our competitive ladder and events. These policies revise and supplement our previous sportsmanship guidelines. Prismata Beta Pre-Season Tourney 2 is this Sunday, and it’s the RAPID ROUND! I’m thrilled to announce that I’ll be hosting another 1-day just-for-fun Prismata Beta Pre-Season Tourney this Sunday! This week’s tourney is the Rapid Round. All games will use Rapid (20s) time controls. Rules are otherwise similar to the previous Pre-Season Tourney from December. As always, players of all skill levels are welcome. There are prizes just for participating, and the tourney is Swiss-style so players will be matched against opponents with similar tournament records. For now, I’m going to leave you with a few quick updates and our plans for the next month or so. It’s time for us to start thinking about tourneys! As a lead-up to next year’s Prismata Beta Grand Prix and World Championship, we’ll be running a series of 1-day just-for-fun tournaments that we’re calling the Prismata Beta Pre-Season. These Pre-Season tournaments will run every couple of weeks before the Prismata Beta Grand Prix launches next year. The exact rules will vary from tourney to tourney, but our goal is to create an enjoyable competitive experience for Prismata players of all skill levels. There will be prizes just for participating! The first Prismata Beta Pre-Season Tournament runs this Sunday. Details and sign-up below! Prismata Blitz Brawls and Achievements! Today, I’m pleased to announce a new Event Mode feature in Prismata: Blitz Brawl. Blitz Brawl is a 1-hour free-for-all Prismata event consisting entirely of 6-second bullet games. Players can start and stop at any time, but the goal is to accumulate as many wins as possible over 60 minutes. Each win is worth 1 point. Draws are worth 0.1 points each. Blitz Brawl will run automatically twice each week from 9:00pm-10:00pm ET on Wednesdays and 2:00pm-3:00pm ET on Saturdays. The first Blitz Brawl will occur at 9:00pm ET tonight! 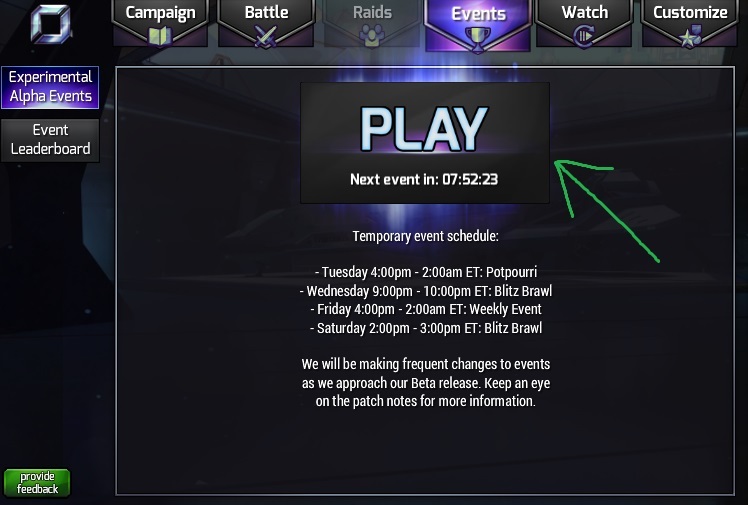 To join the Brawl, just hit the PLAY button in the Event tab once the Brawl goes live! The Blitz Brawl has its own Leaderboard as well, which you can check by clicking “Event Leaderboard” on the left. Just want to give a quick update on how things are going with our Mac/Steam testing. Thanks to everyone for trying out the builds and sending us their feedback! No major issues have been encountered so far. Note: friends will not see you as “playing Prismata” because the game is still in “Beta” mode on Steam. That’s expected.